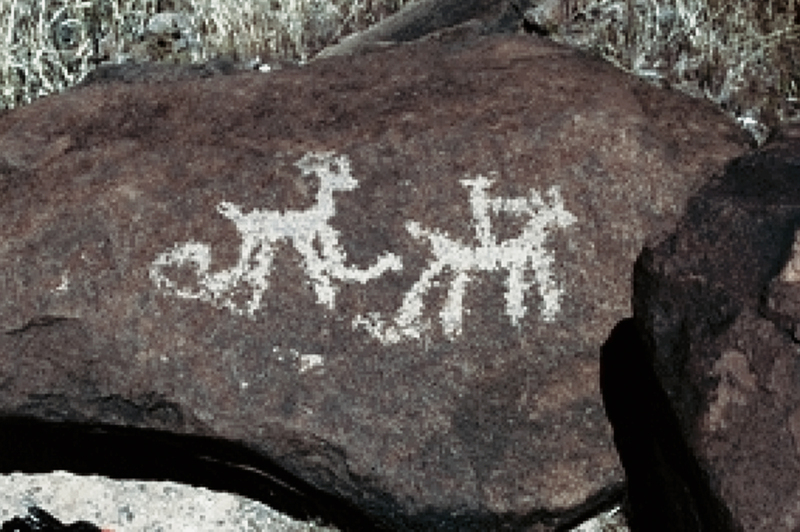 Although the archaeology of Sloan Canyon NCA documents the presence of Puebloan, Patayan, and Southern Paiute peoples (among others), these cultural identities seem to be only weakly expressed through the site's rock art. If the rock art did function to construct and communicate cultural identities with external groups, it did this in a way that we cannot apprehend through its motif assemblage. 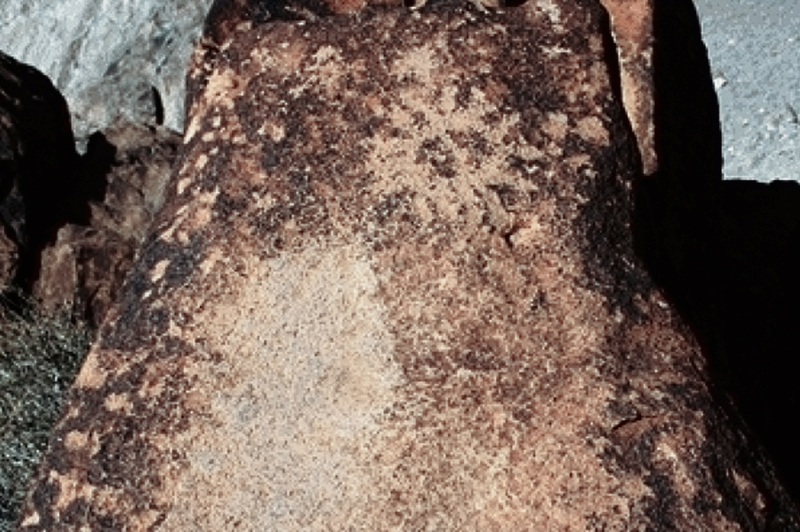 Some rock art is directly associated with milling features and the general archaeological context of the site's art is one of resource acquisition and procurement, and temporary habitation for task-specific purposes. The informing context in which prehistoric populations would have used and encountered the site's rock art is one of daily economic and social routines. The art is generally not in spaces that can be considered private (other than the few panels that are up high above the canyon floor and that are difficult to access) and largely is placed in natural traffic corridors or activity areas. Therefore, it is likely that Sloan Canyon's rock art negotiated and expressed social identities experienced in the routines of daily social life. The art may have been used in a cultural discourse that allowed people to reflect on the lived experience of social and domestic routines, providing a physical embodiment of a social memory that transcended individual experience. We are grateful to the BLM Las Vegas Field Office for the opportunity to have participated in this project and thank Mark Boatwright, Charlie Carroll, and Lola Henio for the various support and assistance they provided during the project. Fieldwork was led by Angus Quinlan assisted by Barbara Struble and Alanah Woody. As ever, Nevada Rock Art Foundation volunteers were invaluable in the field and included: Linda Avance, Susan Bailey, Barbara Bane, Frank Bisceglia, Martha Burk, Richard Capp, Dan Clark, Kathy Clark, Kathie Clinesmith, Larry Clinesmith, Pam Cramer, Frank Crosser, Sue Crosser, Brian Curwen, Vicki Curwen, Peter Davis, Cheryl Ference, Bob Fowler, Grace Maderas, Nancy Gentis, Barron Haley, Anne Higgins, Elaine Holmes, Bill James, Darwin Johnson, Dale Kavula, Rose Keogh, Norman Kresge, Marilyn MacMurtrie, Brendan Mangan, Jona Mangan, AnneMcConnell, Deb Mitchell, John Mitchell, Franco Moller, Patricia Moller, Inge Nagel, Linda Nations, Denis O’Brien, Joan O’Brien, Alan Personious, Lynne Personious, Paula Reynosa, Rebecca Scharf, Matthew Schneider, Mary Sheets, Barbara Slivac, Jill Stovall, Jeff Thelen, Lorrie Vavak, Gary Vetter, Loretta Watson, Margaret Westcamp, and Chuck Williams. Volunteers who helped to process field drawings included: Carolyn Barnes-Wolfe, Anne Carter, Janice Hoke, Elaine Holmes, Bill Jackson, Joanne Jackson, Pan Lambert, Anne McConnell, and Laura Ouimet.